It’s been a year since a bathroom leak drove Willie out of her Orlando home she’s lived in for nearly 50 years. Water poured out of a tank inside a bathroom and flooded Willie’s home. The flooding led to mold growth and a cracked ceiling from moisture. The mold destroyed Willie’s clothes and furniture. She moved in with her sister before ending up in a hospital for three months. Willie had her toe amputated. “I think when I stepped in the (flood) water, I think (bacteria in the water) infected my toe,” she said. It’s taken a year to get her home slowly repaired and habitable again. 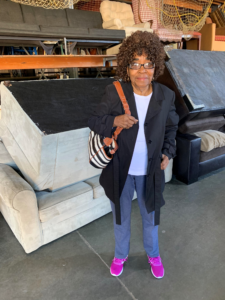 Willie said her sister’s neighbor told her to seek help from The Mustard Seed for home furnishings and clothing.